Click the "Recurrence" tab on the Event Editor. Use the "New -> Recurring Event" command on the File menu or the calendar view's right-click menu. VueMinder supports a powerful variety of recurrence patterns and ranges. If your event periodically repeats, chances are you'll be able to specify its recurrence using the settings described below. You can specify event recurrence on the "Recurrence" tab of the Event Editor window, when the "Recurring Event..." box is checked. Daily, weekly, monthly, and yearly recurrence patterns can be specified for the recurring event. Each of these patterns have additional settings, described in more detail below. If your event occurs every day, every weekday, or every other number of days, use the Daily recurrence pattern. In the example above, the event occurs every 3 days. 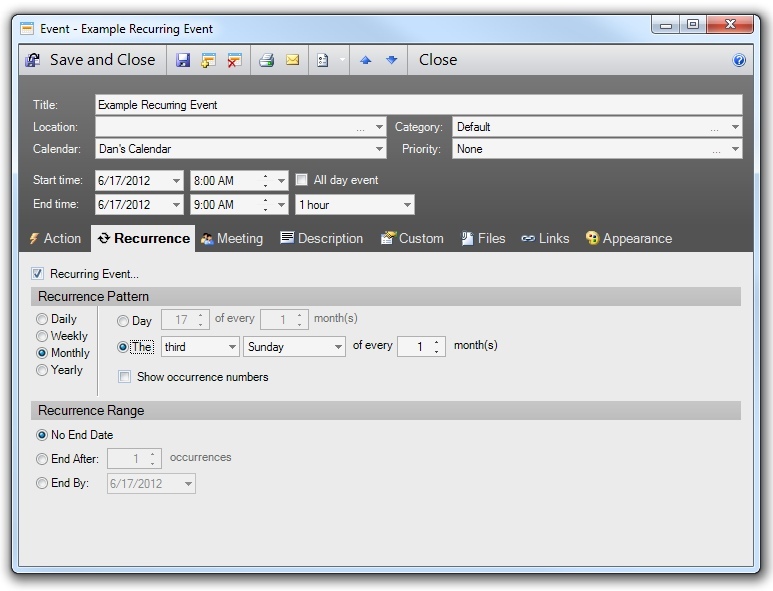 To show an occurrence number for each instance of the recurring event series, check the "Show occurrence numbers" box. The first occurrence will include "(#1)" at the end of the event title in the Calendar View. Each subsequent occurrence will increment this number. If your event occurs the same day or days of every week (or every other number of weeks), use the Weekly recurrence pattern. In the example above, the event occurs every other week on Monday and Saturday. If your event occurs the same day of the month (or every other number of months), use the Monthly recurrence pattern. In the example above, the event occurs on the fourth Saturday of every month. If your event occurs the same day every year, use the Yearly recurrence pattern. In the example above, the event occurs on the fourth Saturday of October. To show an occurrence number for each instance of the recurring event series, check the "Show occurrence numbers" box. The first occurrence will include "(#N)", where N is the specified starting number, at the end of the event title in the Calendar View. Each subsequent occurrence will increment this number. A recurrence range can be specified, where the recurring event series will end after a specified number of occurrences or after a certain date. VueMinder does not support defining a recurring event with a duration large enough to cause occurrences of the event series to overlap. For example, if you define an event with a duration of 2 weeks, but set the recurring pattern to happen every week, this would cause occurrences to overlap. If the Event Editor detects this condition when the OK button is clicked, a message will be displayed. To correct this, reduce the event duration, or change the recurrence pattern so occurrences won't overlap.